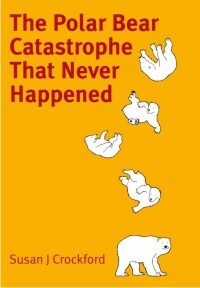 It’s buffet time for polar bears but the most dangerous time for cute baby seals. Ringed seals are most likely to be encountered and eaten by polar bears. While they are the smallest of the ice seals, they are the most abundant and are found throughout the Arctic. The global population has been estimated at 3-4 million (Kelly et al. 2010). 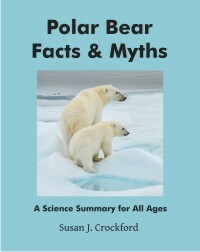 However, there are also much larger bearded seals scattered throughout polar bear territory and while they are much less abundant than ringed seals, polar bears eat them when they can. In addition, depending on where in the Arctic polar bears find themselves, a number of other less abundant ice seal species are also available: in the west (e.g. Bering, Chukchi, and Beaufort Seas), there are ribbon and spotted seals (and see References below) and in the East (Davis Strait, around Greenland, through to the Barents and beyond) are harp seals and a few hooded seals. Polar bears will often eat only the fat from a seal they have killed, especially in the spring and early summer when fat newborn seals are abundant – see Fig. 1 below. Biologists suspect that polar bears may be able to live entirely on fat. Not only is fat high in calories, it does not require water to metabolize. Digestion of fat releases water, which may be useful in an environment where free water is often available only as snow and ice (Amstrup 2003:592). Figure 1. The ice seal species consumed by polar bears, pictured at or close to weaning age when they may be 50% fat by weight. Ringed seals are consumed the most often, with bearded seals the second – other species are consumed if encountered but they are much less common and occur only in particular areas. The banana is a reminder that polar bears usually eat the fat of seals first, pealing the skin off the body and consuming the underlying fat. When seals are abundant, adult bears may not eat any more than the fat, leaving behind the carcasses – which are then available for younger bears and arctic foxes. – Ringed seals (pack ice-dwelling ecotype), 3 weeks or so (Fedoseev 1975:159); born mid-March to mid-April. – Ringed seals (shorefast ice-dwelling ecotype), 5-7 weeks (Nowak 2003:118); born mid-March to mid-April. – Bearded seals, 12-18 days (Nowak 2003:109); born mid-March to early May (peak late April but 2 weeks earlier in the southern Bering Sea). – Ribbon seals, 3-4 weeks (Nowak 2003:123); born early April to mid-May (peak early to mid-April). – Spotted (aka Largha) seals, 3-4 weeks (Nowak 2003:120); born late March to mid-May. – Hooded seals (Reeves et al. 2002:148), 4 days (shortest lactation of any mammal) (Nowak 2003:112); born mid-March to early April. – Harp seals, 10-12 days (Nowak 2003:115); born late February-early April (Sergent 1976, 1991), peak early to mid-March. Seal pups are about double their birth weight or heavier by the time they are weaned, when they may be 50% fat by weight (male seals hang around the mother-pup pair and mate with the female around the time the female stops nursing) – the perfect meal for fat-craving polar bears. You can see by the above dates that at this point in the year (late May), we are just past the period of greatest abundance for just-weaned ringed and bearded seals (since most are probably born around early April and late April, respectively). Even in Hudson Bay and the northern Bering Sea (including around St. Matthew Island, see previous post here), there is still lots of sea ice providing a hunting platform for polar bears (Figure 2, below). Figure 2. 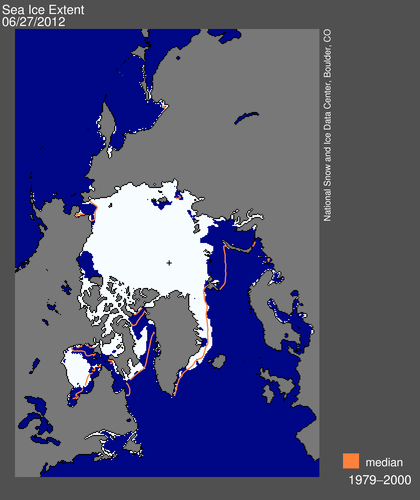 Sea ice extent at May 24, 2013 (NSIDC). Still far more ice than average in the Bering Sea (upper left) and less than average in the Barents Sea (lower right). See previous post here for maps from May 15. There will still be super-fat, newly-weaned seal pups after this peak period, of course – they might be just a bit harder for polar bears to find. And as the surviving young pups learn how to feed themselves over the next few months, they remain easier for polar bears to catch than adults because of their lack of experience evading predators. 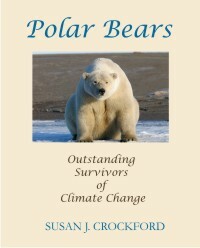 Both polar bears and Arctic seals need ice in the spring: polar bears for hunting, seals for nursing pups and mating. 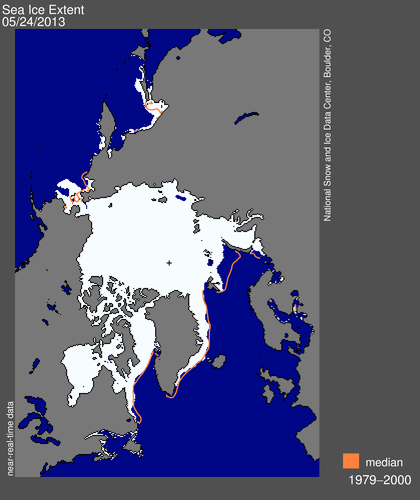 Even if sea ice declines to levels seen last year (2012), we should see plenty of ice remaining as a hunting platform for polar bears until the end of June – see the ice extent graph below (Figure 3). Fig. 4 shows ice extent at 27 June 2012, while Fig. 5 shows, for comparison, the extent at 30 Jun 2009 (the latest year that breakup dates for western Hudson Bay have been calculated, see previous post here). Figure 3. 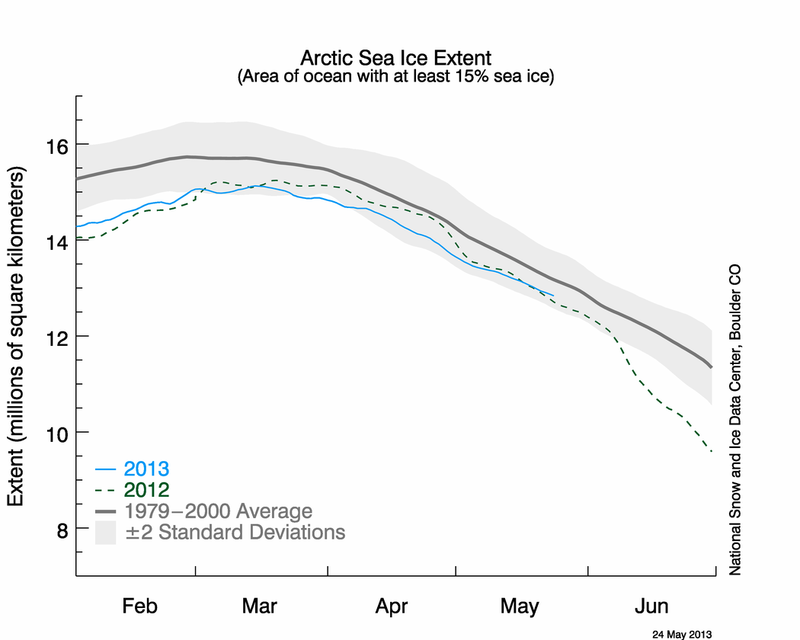 Arctic sea ice extent graph at May 24, 2013, against 2012 and the 1979-2000 average. Figure 4. Sea ice extent at June 27, 2012 (NSIDC), showing the ice remaining in Hudson Bay and the Chukchi Sea (upper left). Figure 5. 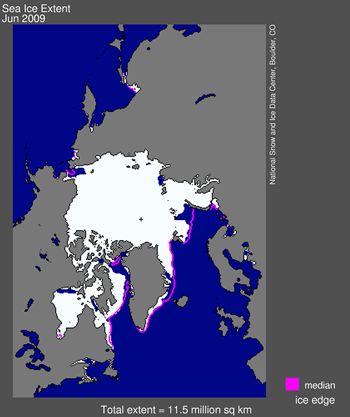 Sea ice extent at June 30, 2009 (NSIDC), the year that polar bears in western Hudson Bay had ice for hunting well into August (as late as in 1992), see previous post here. Boveng, P. L., Bengtson, J. L., Buckley, T. W., Cameron, M. F., Dahle, S. P., Megrey, B. A., Overland, J. E., and Williamson, N. J. 2008. Status review of the ribbon seal (Histriophoca fasciata). NOAA Technical Memorandum NMFS-AFSC-191. Finley, K. J, Miller, G. W., Davis, R. A., and W. R. Koski 1983. A distinctive large breeding population of ringed seal (Phoca hispida) inhabiting the Baffin Bay pack ice. Arctic 36:162-173. Nowak, R. M. 2003. Walker’s Marine Mammals of the World. John’s Hopkins University Press, Baltimore. Sergeant, D.E. 1976. 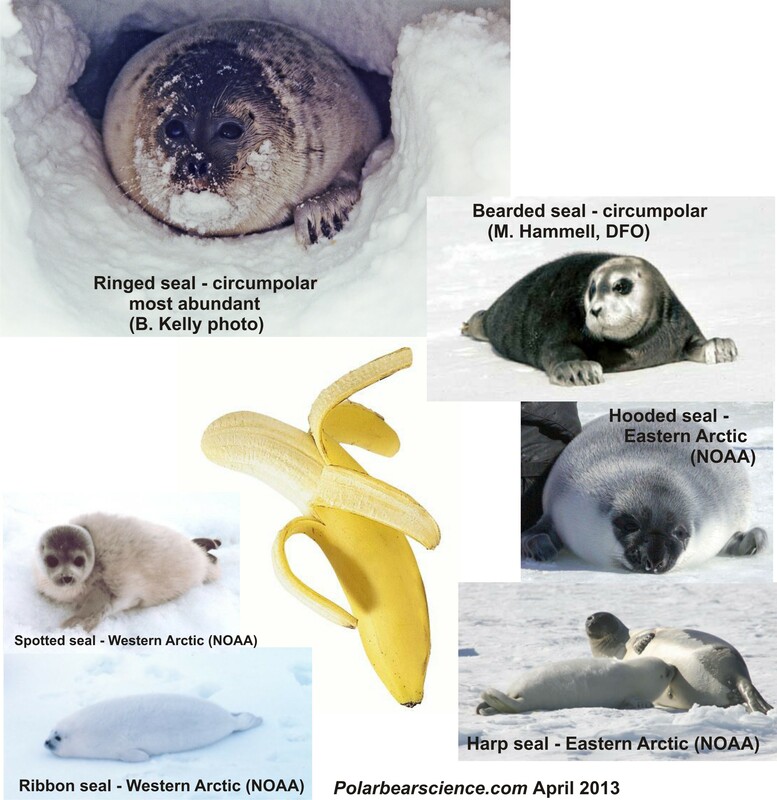 History and present status of populations of harp and hooded seals. Biological Conservation 10:95-118. Sergeant, D.E. 1991. Harp Seals, Man and Ice. Canadian Special Publication of Fisheries and Aquatic Sciences 114. Fisheries and Oceans Canada, Ottawa. Smith, T. G. and Hammill, M. O. 1981. Ecology of the ringed seal, Phoca hispida, in its fast ice breeding habitat. Canadian Journal of Zoology 59:966-981. This entry was posted in Life History, Sea ice habitat and tagged bearded seals, Bering Sea, Chukchi, ESA, fat, fat baby seals, harp seal, hooded seal, Hudson Bay breakup, hunting platform, IUCN, ringed seals, sea ice extent. Bookmark the permalink.